This spectacular 2 bedroom / 2 bath GULF FRONT condo provides breath-taking views of the emerald green waters of the Gulf of Mexico. Come soak in the panoramic views of the Gulf of Mexico in this spacious unit that can accommodate up to 6 guests comfortably. There is a queen bed in the master bedroom a full bed in the 2nd bedroom a queen sleeper sofa in the living room. A fully stocked kitchen, separate dining room, large living room, two full bathrooms and washer/dryer are provided for your comfort. Wake up in the morning and enjoy a cup of coffee on your large balcony while soaking in the morning sunrise. Come and enjoy all that Destin has to offer. Amazing views, sugar white sand and emerald green waters are just a few of the luxuries that you will enjoy during your stay. 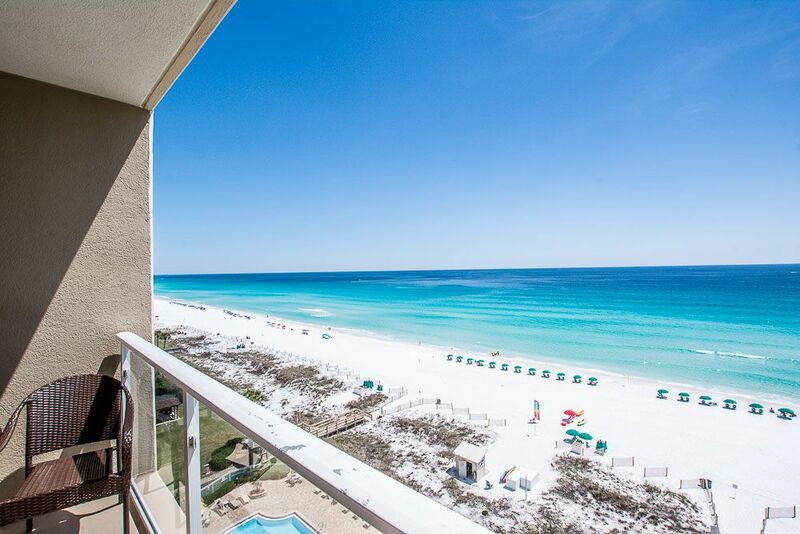 You will feel totally relaxed and refreshed after spending time on some of the prettiest beaches that the Emerald Coast has to offer. You will be glad you did. This condo is ideally suited for families and offers a pool, hot tub, and fitness center. The property is close to many excellent restaurants such as Bubba Gumps, Joe's Crab Shack, local seafood companies, entertainment and attractions like the Track, mini golf and Big Kahuna's waterpark. Come have some fun!! We are waiting to welcome you to the beach!!! We had a wonderful time. The condo was perfect! We loved the condo! We would recommend it and also return. It was perfect! Thank you for your review. We are so glad that you had a good time. Please come and stay with us again when you return to Destin. This place was extremely clean. The grounds crew kept everything very clean. Our condo was perfect for us, small but had everything we needed. Will definitely consider booking again. Our condo was beautiful! The view amazing....right on the beach. The staff was so helpful with any questions we had. If you want to rent 2 chairs w/umbrella $30 a day which is worth it. We will be back! Thank you a beautiful and amazing get away! The condo was the perfect size. It was a little outdated, but was clean and comfortable. Awesome condo and clean ! Everything was very enjoyable. Only negative thing I have to say is that I didn’t like having to go and find and maintenance person as soon as we arrived to get my parking pass and pool bracelets. I thought it would be left in the room. Also needed more blankets for the sofa bed. Other then that perfect. Thank you so much for your review. We are glad you had a great time and that you found the accommodations clean. We left two blankets in the room after you notified us and hope that you found those for your use. We welcome you to come back and see us again. We'd love to have you be our guest. Enjoy your summer! Rates are subject to change without notice. Taxes, Cleaning Fee and Reservation Fee ($61.05) are not included in above rental rates.